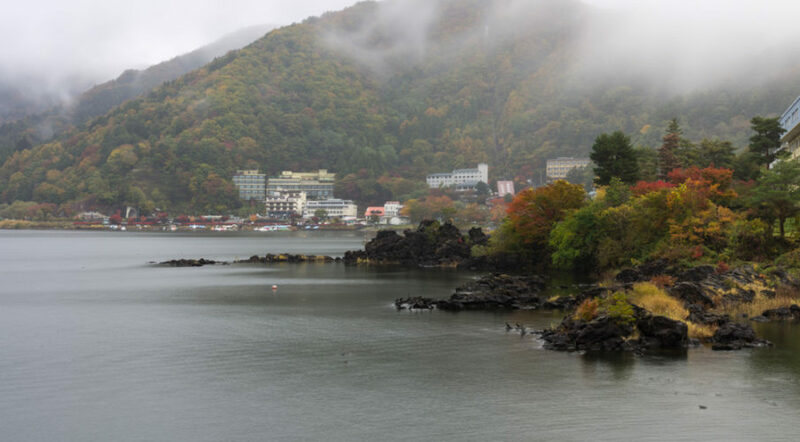 A train and bus ride from Kyoto (via Mishima) with a bit of a rush at Mishima station to get the Fujikyu bus to Kawaguchi-ko, and even before stopping at Fuji-Q Highlands (second last stop) or Yamanaka-ko (last stop before Kawaguchi-ko), it appeared. 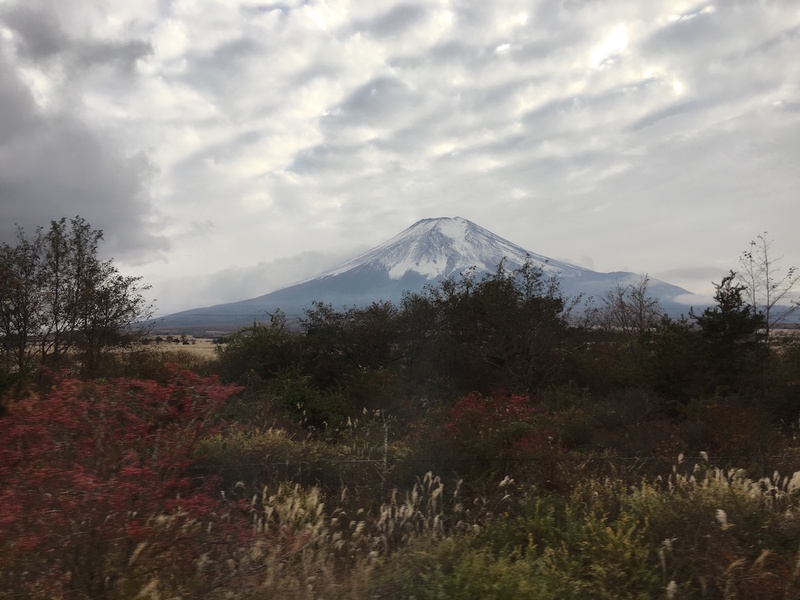 Mount Fuji emerged from behind the clouds and presented itself in the most brilliant of bus ride views. We probably ended up with 36 views of Mount Fuji as we drove around the lakes toward Kawaguchi-ko. Definitely some pretty clear views that afternoon and with some dramatic clouds as well, I only managed one shot at the bus stop before we headed to our accommodation, 15 minutes downhill walk, by the time we got there though Fuji-san was hiding again. Never mind, we’ll see you again later, and if not, we at least got some good views on the bus. After settling in, and checking the forecast for the next few days, it was almost certainly going to be an overcast day with no views of Fuji-san the next day, but clear for the two days after. 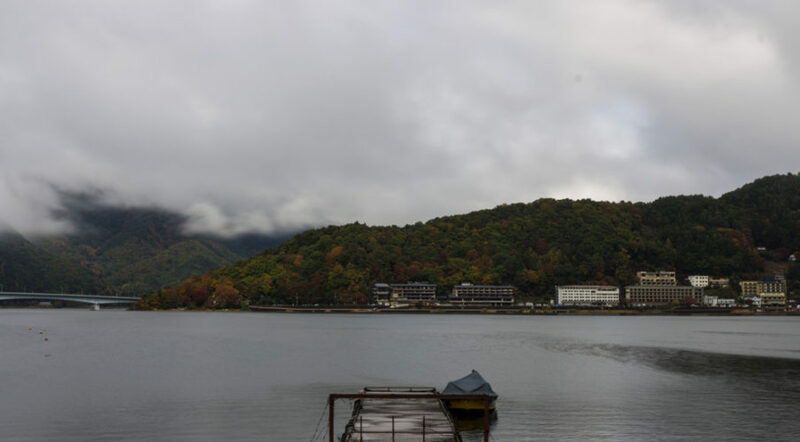 With overcast skies and no real chance of the sun clearing the clouds out of the way we decided to wander over to Kawaguchi-ko and have a look around. 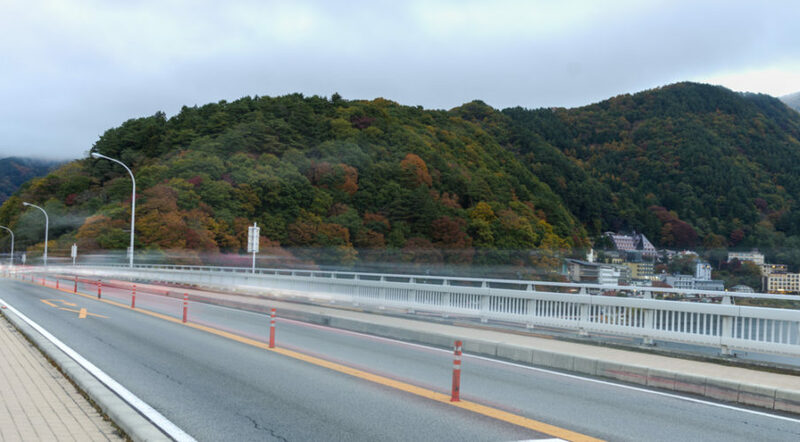 Beautiful red leaves were abound by the lake, and Mount Kachi Kachi was starting to show some Autumn colour as well, although still mostly green. We didn’t get too far before it was time for lunch (hoto fudo, more on that later), and then after that the oldies went and took some pictures in a nice leafy Autumn spot (with coloured leaves fallen to the ground) while we went back to the hostel and a nap. I managed to get back out to Ohashi bridge just before sunset to hopefully capture something of Mount Fuji, I caught a glimpse of the cone but by the time I snapped the shot it was clouded over again. So instead I shifted my attention to the road, traffic, and the colours of the hills behind. Got a pretty nice shot, would’ve been nicer if it was a bit darker but then I suppose I wouldn’t have captured any of the colours in the background. We signed ourselves up for the hostel day tour around the five lakes area the next day, so that will be coming up in the next post. The picture to the right gives a glimpse of the weather to come, that was the next morning, so definitely cleared up for our day trip but that’s for the next post. 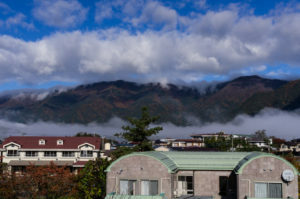 Kawaguchi-ko is a great destination and I definitely love going there and I have no doubt that I’ll be there again, but you’ll see for yourself in the next couple of posts.